Give Up Your Glasses for Good is a step by step self-healing course that teaches you how to improve your vision naturally. Heal your own eyes holistically with this comprehensive workbook that includes over fifty vision enhancing practices and dozens of eye charts and reading that can help decrease eyestrain and increase clarity. Sit back and relax as you watch your vision return to its original state; a state of equilibrium, ease, and auto-focus. After its original release in 2015, this new updated third edition provides an even clearer path to clarity with a brand new chapter on healing the mental and emotional root causes of vision problems as well as a more in-depth description of how to turn books and eye charts into vision training tools. 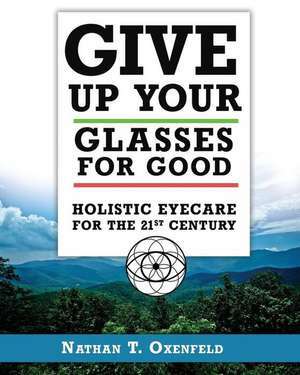 With nearly 100 more pages than the last version and even more powerful techniques contained within, this new version will yield even more rapid and measurable results in your natural vision and help you do what the title suggests: give up your glasses for good. The last edition was very well received with 4.9 out of 5 stars and lots of positive reviews sharing success stories of improvements. "This is by FAR the best natural eyesight improvement book I came accross (I read more than 5 different ones)!!! Nathan writes with clarity and such eloquence. You will not leave any chapter confused or wondering what if...or will this work. I am savouring this book while taking a class with him and in only 10 days I see sharper images and get flashes after gentle blinks (used to take a good squeeze to get a flash). If you are just starting your Bates program or you are stuck along your journey of recovering your birthright of clear vision get this book!" -V.M. Nathan T. Oxenfeld is a certified teacher of the Bates Method, Yoga, and Meditation. He skillfully blends these three together to form this dynamic and relevant course that helps people of all ages address the underlying root causes of vision problems instead of just treating the symptoms. Whether using this book as a way to prevent future vision problems or as a way to reverse current vision problems, healthier eyes will always be the result. Maintain healthy eyes and maintain the birthright of healthy vision for life. Nathan is also the creator of the online vision improvement course called the Holistic Vision Program, which takes this book to the next level with follow-along instructional videos and audios. Visit https://www.integraleyesight.com/ for more info and to check if he is teaching an in-person vision improvement workshop in a city near you!